The Duomo or Santa Maria Assunta. It was a horrible, windy, rainy day in early May of 2010 when we visited the famous city of Pisa in Tuscany. 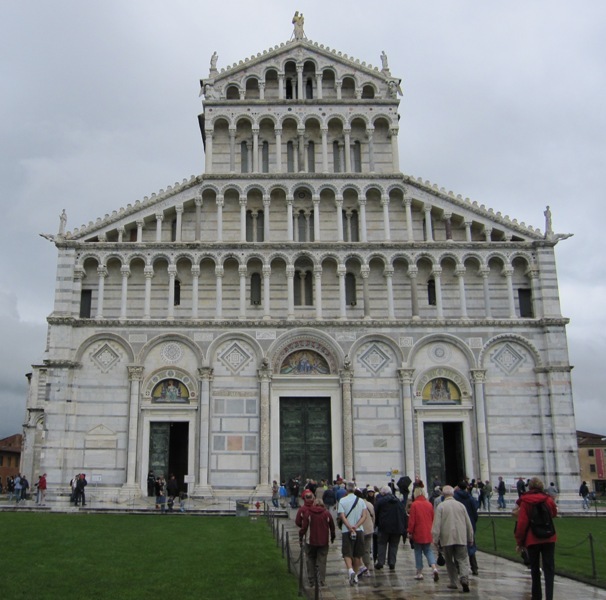 Pisa has a long and illustrious history, and nowhere is this illustrated more than at the Piazza dei Miracoli – the Square of the Miracles – in the historical city centre. When we arrived by train, the rain was so bad we had to seek shelter inside the railway station. Umbrellas were useless because of the strong wind, and when it had finally stopped raining and we started walking, it began raining again after a mere ten minutes. This was just not our day. We found shelter at a lovely trattoria and had some excellent pasta. For some reason, the curtains in the trattoria had all been closed, which gave the place a cosy atmosphere and effectively blocked the sight of yet more rain outside. After lunch, we continued our tour towards the Piazza dei Miracoli, or the Piazza del Duomo as it is officially called. 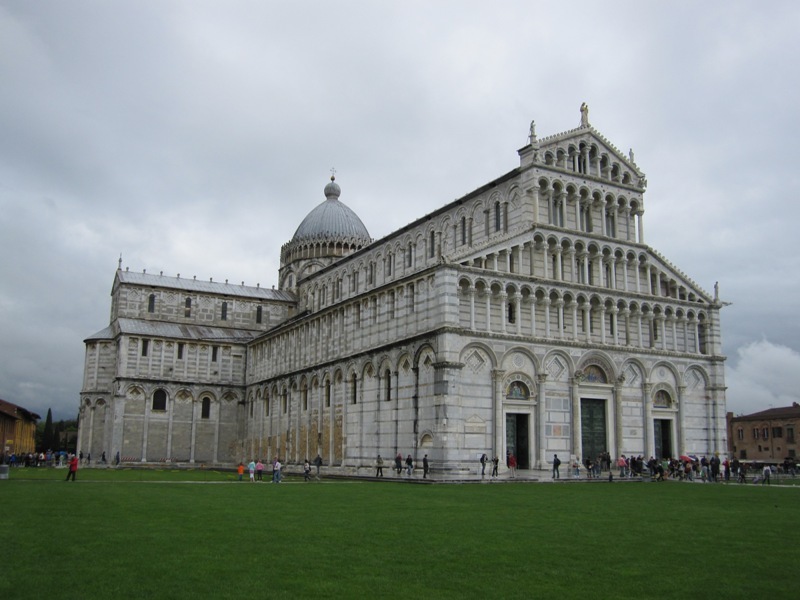 The most famous building in Pisa is arguably the Duomo’s campanile, usually known by the moniker Leaning Tower of Pisa. I must say the campanile is not that interesting. The only reason why it is so famous is that it is indeed leaning, and leaning badly. I will discuss the tower separately and will now focus on the building I did find interesting: the Duomo, or the Santa Maria Assunta. Construction of the cathedral started almost 1.000 years ago. In 1063, a Pisan fleet sailed south and raided the Muslim-held city of Palermo on Sicily. At that time, Sicily was an Arabic Emirate, but it was under attack from Norman armies led by Robert Guiscard and his brother Roger, who fought under a papal banner. Although the brothers would not take Palermo until early 1072, the Pisan raid aided their efforts to conquer the island. 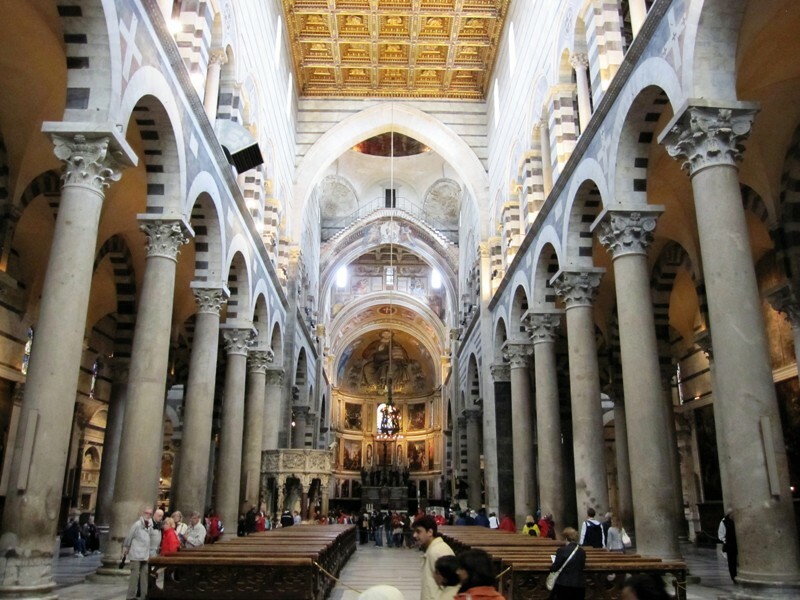 It was a great success, and the Pisans carried off much loot which they used to start the construction of the Duomo. Building activities commenced in 1064 and the first architect was a man known as Buscheto. The building, constructed in a Pisan Romanesque style, is a classical Roman basilica with a high nave and lower aisles. It has a transept, which gives it the shape of a Latin cross, with the apse facing east. The facade of the cathedral is very impressive, with four levels of colonnaded galleries, basically four loggias on top of each other. The building is topped by a statue of the Madonna and Child. The cathedral was badly damaged by fire in 1595. The fire destroyed the original doors, which had to be replaced by new ones provided by the workshop of Flemish sculptor Jean Boulogne, who went by the name of Giambologna (1529-1608). The fire also damaged much of the interior of the cathedral and it had to be almost completely redecorated. The gilded and coffered ceiling was added after 1595. The cathedral used to hold the tomb of Pope Gregorius VIII (pope in 1187), who had died in Pisa after a pontificate of less than two months. This tomb, too, was consumed by the flames. 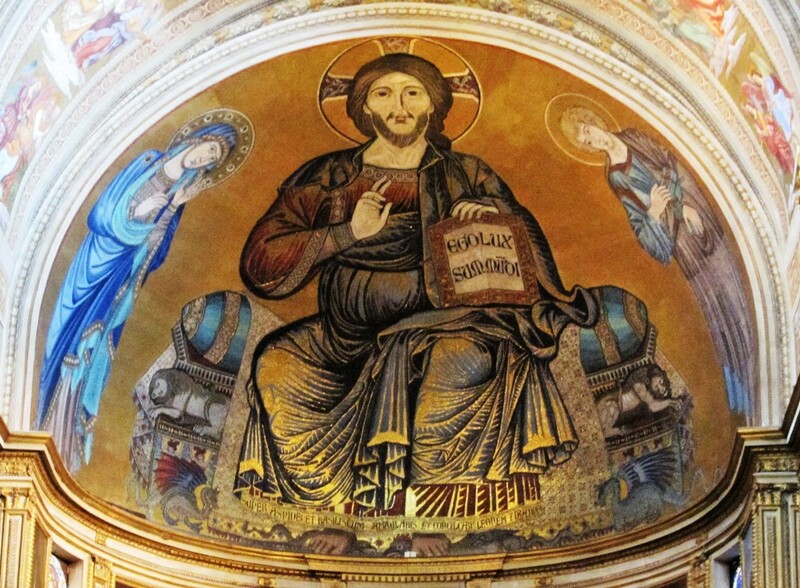 Fortunately, the fire did not destroy the majestic apse mosaic of Jesus Christ as the Pantokrator, flanked by the Virgin Mary and Saint John the Evangelist. It was completed around the year 1320 and is often attributed to the Florentine artist Cimabue (ca. 1240-1302). Which can be translated as: “You will tread on the asps and the basilisk, and trample the lion and the dragon”. Indeed, if you look closely, you will see that Christ is crushing a snake and the legendary basilisk with his feet. To his left and right are two lions and two dragons. In the early Middle Ages, the dragon was a metaphor for the plague. I am not sure whether this is also the meaning of the dragons in the mosaic, but the mosaic was in any case completed before Pisa and many other Italian cities were struck by the Black Death in 1348. 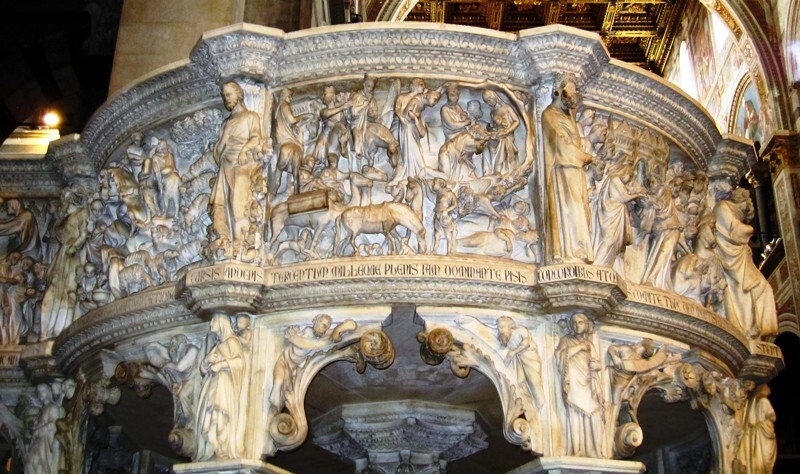 Another precious work of art that survived the 1595 fire is the early fourteenth century pulpit by Giovanni Pisano (ca. 1250-1315). The pulpit is decorated with panels featuring nine New Testament scenes. For instance, the scene on the right depicts the Adoration of the Magi. Although the pulpit was spared during the fire, it was apparently “misplaced” and was lost for over 300 years. It was only rediscovered in 1926 and then returned to the cathedral. The pulpit we see today is probably a copy, the original having been moved to the Cathedral Museum. 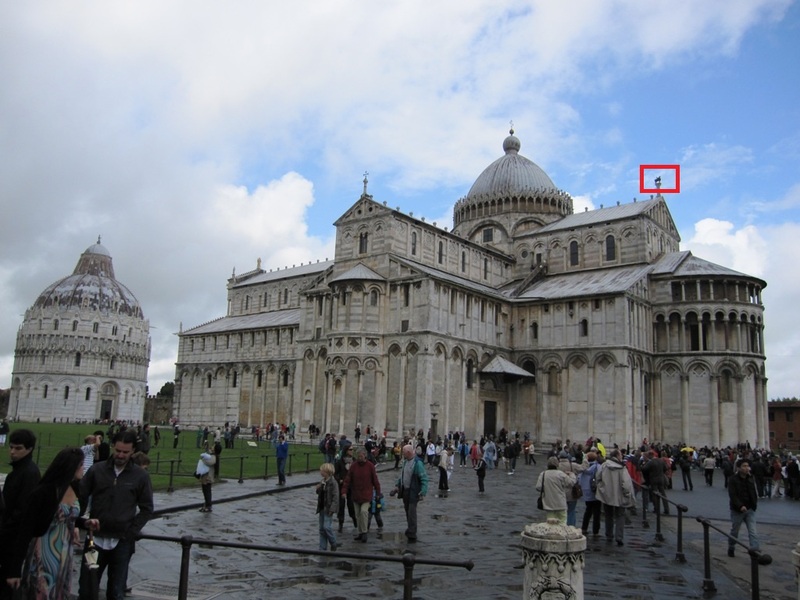 High above the ground, on a column on the roof of the cathedral, sits the Pisa Griffin (see below inside the red box). It is a bronze sculpture of Islamic origin, probably the largest of its kind. The sculpture represents a griffin, a beast known in Greek and Arabic mythology, with features of several animals, including a horse, a lion, a rooster and an eagle. The object was probably stolen during a raid in Islamic territory by the Pisan navy in the eleventh or twelfth century. At that time, the Pisan maritime republic was at the height of its power. The original griffin was moved to the Cathedral Museum long ago and replaced by a copy. It was the copy that I saw on that rainy day in May 2010, just when the clouds were giving way to a little bit of blue sky. Update 25 August 2017: text and pictures have been updated.